Faculty and staff across campus raised more than $53,000 for local middle Tennessee charities through this year’s Belmont Cares Campaign, a campus-wide initiative to raise funds for a number of causes throughout the area. The campaign, lead by Director of Business Operations Aaron Jerome and his committee, encourages Belmont employees to engage with the community in a powerful way. This year’s efforts hit a university milestone as the initiative raised more than any year previously. 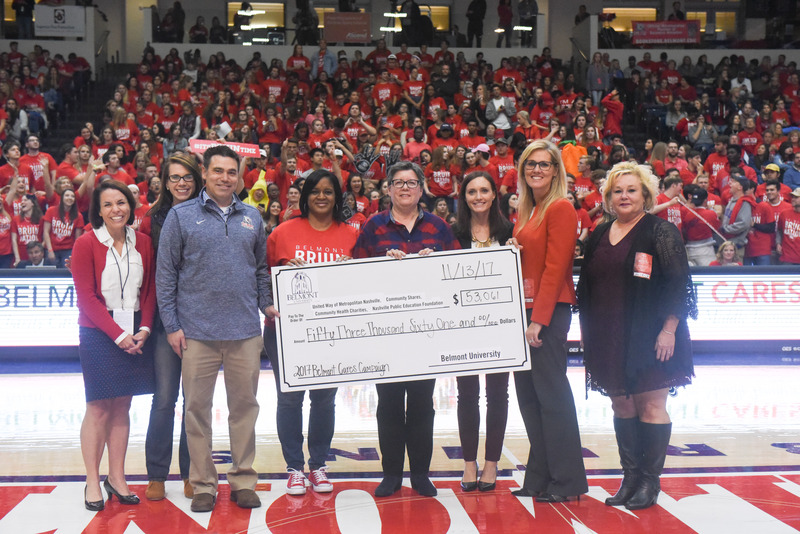 A check for the campaign’s total was presented during Belmont’s men’s basketball home opener game against Vanderbilt on Monday, November 13. During the month of October, the 2017 Belmont Cares Committee hosted a number of events including a Two Buck Breakfast and Five Buck Lunch where faculty and staff were encouraged to enjoy a meal together for a good cause. Weeks later, the campaign’s annual Food Truck Frenzy invited food trucks to campus for folks to enjoy while a balloon popping station encouraged participants to purchase a balloon, filled with a gift card surprise, for $10. Jerome said, “I’m so grateful to have had the opportunity to be part of the Belmont Cares Campaign this year. It’s exciting to see our faculty and staff support the important work of so many organizations throughout our city, and I look forward to the continued impact we’ll have year after year.